CIDA - What is CIDA? Want to know more about the structure and scope of CIDA? About the key policies that shape CIDA's work around the world? 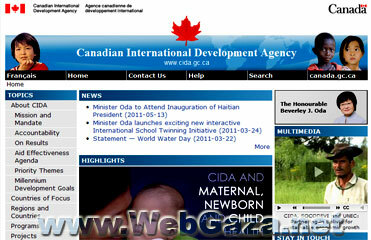 Curious to know where CIDA maintains a presence in Canada and what are the results of CIDA activities? This section of CIDA's website provides a number of windows through which you can gain a better understanding of what CIDA is all about. The Government of Canada's is committed to making its international assistance more efficient, focused and accountable. A key element of this Aid Effectiveness agenda is transparency. CIDA is fully committed to make public useful information to enhance its transparency and accountability.